BnB Faoug price per day from CHF 130 Set on the outskirts of Faoug, 150 metres from Lake Murten and 30 km from Bern, BnB Faoug offers studios with a balcony or a terrace. Free Wi-Fi is provided in the entire building and free private parking is on site. Breakfast is possible upon request and will be brought directly to the studio..
Hôtel-Restaurant de la Tour price per day from CHF 185 The family-run Hôtel-Restaurant de la Tour is 300 metres from La Tour-Village Train Station in La Tour de Trême. It features free WiFi and a renowned gourmet restaurant. All of the simply furnished rooms at Hôtel de la Tour have cable TV and a bathroom. Hine Adon Aparthotel Bulle-Gruyère price per day from CHF 145 . The Old Town Flat price per day from CHF 260 . 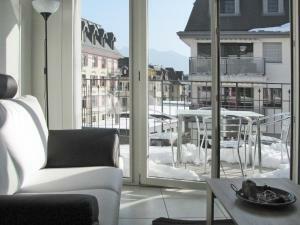 Hotel Le Sapin price per day from € 106 This hotel is set in the centre of the mountain village Charmey. Hotel Le Sapin houses 2 restaurants: the Poya featuring Italian cuisine and the La Pièce Rouge Brasserie specialising in beef dishes. Guests can obtain reduced tickets for the swimming pool and wellness centre, which is 50 metres from the Le Sapin..
Saanewald Lodge price per day from € 106 Located at 1,400 metres above sea level right next to the slopes of the Saanenland Ski Area, the Saanewald Lodge offers free use of its sauna, steam bath, and hot tub. They offer views of the valley and the mountains, or of the forest and the garden. Hotel Bad Schwarzsee price per day from € 73 Offering panoramic views of Lake Schwarzsee and the Fribourg Alps, this 3-star hotel is just 150 metres from the lakeshore and 1 km from the Kaiseregg Ski Area. All rooms at Hotel Bad Schwarzsee overlook the lake or the mountains. A ski storage room and free parking are available on site..
Hôtel Cailler price per day from € 278 Directly linked via an underground hallway to the Gruyère Spa, Hotel Cailler offers you charming country-style rooms and fine cuisine. 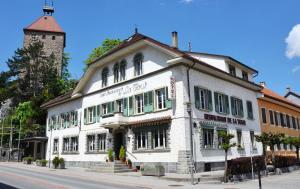 Youth Hostel Avenches price per day from € 27 Newly renovated in 2014, Youth Hostel Avenches is a 15-minute walk from the Avenches train station. A buffet breakfast is served free of charge, and free WiFi in the entire hostel is provided as well.